Good day people! With all the madness of listing off upcoming Record Store Day releases (check them out here) we don’t want to forget about the great music that is out now! 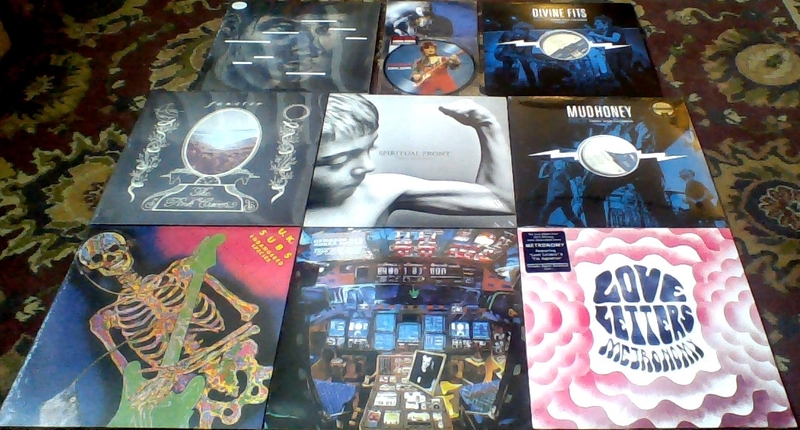 Here is what just showed up at the shop, loads of new releases and a few re-stocks. We’ll detail the new releases first with sample tracks or videos then the re-stock list at the bottom. Don’t forget you can always check out all the tracks from featured 2014 album releases at our soundcloud stream here: Listen now! Kiwanuka, a 25 year-old UK native of Ugandan heritage, was raised in north London where he split his time between session work and local gigs. Along the way, having found footing as a solo artist, he was signed to Communion Records, then Polydor, and has since performed throughout Europe and North America too- touring in direct support of Adele. He made his way through Nashville this past summer with just enough pause and aplomb to commit these morsels to tape. The A-side ”You’ve Got Nothing to Lose” is an original composition, featuring The Buzzards’ Dominic Davis on upright bass and Cory Younts on piano, joined also by fellow balladeer Lillie Mae Rische on fiddle. Their contributions transform his work into a stone-cold groove with almost orchestral underpinnings, making it a fitting extension of their previous Blue Series. The single also features a chilling rendition of Townes Van Zandt’s infamous ”Waitin’ ‘Round to Die” on the B-side, the perfect compliment to the timbre and mood of the A-side. Another great installment in the BOWIE 7″ single Pic-Disc series. As we trudge through the final moments of Winter, we present to you this live album born out of the sweaty and oppressive Tennessee Summer… DIVINE FITS, comprised of Spoon’s Britt Daniel, Wolf Parade/Handsome Furs’ Dan Boeckner, Gaunt/New Bomb Turks’ Sam Brown and Alex Fischel, recorded an epic set in July of 2013, ending the performance by bringing a fan up on stage to destroy a piñata and litter the blue room with Snickers and Twix… Rock ‘n’ roll at its sweetest. Recorded Direct-To-Tape on June 17th, 2013 at Third Man Records in the Blue Room. Fenster’s second record, The Pink Caves, is a dark fairy tale brimming with layers of tremolo guitars, tactile percussion, soft analog synths and moon-dusted vocal melodies. The tracks take you on a slow-motion free-fall through the rabbit hole into an ethereal world of spectral soundscapes, lush pop opulence and minimalism, drawing inspiration from science fiction, French ’70s film scores, and Lynchian mysticism. Work began on The Pink Caves in early 2013. A home studio was set up in a cabin in East Germany and the whole house was wired so every room contained different elements, set up in such a way that they were able to record live altogether. As a result, The Pink Caves radiates with an intuitive and spontaneous approach to noise experimentation. The band reputedly used the house they recorded in as an instrument in itself, using slamming doors, the clanging metal oven, the ticking of clocks, the animals in the yard, the water in the well, candlesticks, coat hangers and matches… whatever happened to be within reach. All of this was captured by producer Tadklimp, whose idiosyncratic and inimitable production skills unravel the complexities and textures of the album. The new album plumbs the depths with broken and cracked bits. With this record, Fenster ventures into new spaces, exploring different techniques, instrumentation and song structures. The album’s title and aesthetic derives from the concept of a make-believe heaven — a place you go when you die that only exists in your mind. Thee Oh Sees sideproject! Recorded at home in the fall of 2013 with a variety of synthesizers, drum machines and assorted handmade electronics, Damaged Bug is Oh Sees mastermind John Dwyer’s latest bit of cracked pop alchemy. The project is the cure to the ailment of too much guitar for too long. Fizzing and sputtering like a glowing, temperamental cockpit control panel, Dwyer bunkered deep in a blinking laboratory, penning songs about the long arc of our travels across space and time. Propulsive beats and synthetic veneers coat laser-guided melodies reflecting off shiny metal surfaces while instrumental interludes pop in and out like breaks in the asteroid belt. A far-out side of our main man – nocturnal, hard-wired, and chrome-plated. Hubba Bubba features original artwork by Deirdre White. Joseph Mount, from Totnes in Devon, is the lead singer and architect of Metronomy. His new album, Love Letters, has a title that speaks volumes about sensations and modes of communication, about things that have always been there, and will always be here. In its execution, Love Letters tries to do fresh things in an old-fashioned way. It takes richer methods of recording and injects them with the shock of the new – of tight electronics, and experiments in sound. It does so not to be retro, but to embrace the quality standards of the past. It also aims to be up there with the greats, reaching for those old stars. It helps, of course, that Metronomy have had an incredible few years. 2011’s The English Riviera took a West Coast sunshine spirit to Britain’s south-west, and gained many plaudits, including a Mercury nomination. The English Riviera was called “visionary” (NME), “exotic” (Mojo) and “stylish” (The Times); the Evening Standard called the record “a revelation”; i-D even called his band “pioneers”. They also sold out the Royal Albert Hall, toured Europe and North America extensively – many bands would wallow in those glories, but not them. Mount never wanted to rest on his laurels as a writer, either. Instead, he wanted a new challenge, and to learn discipline. Instead of constructing his music on computers, he would use classic, slower techniques that would force him to take time in the best possible sense. By recording onto tape, he would also be forced to think about his music more purely, construct it with more finesse, and enjoy exploring its possibilities. Down a quiet driveway in East London is an old-fashioned studio. It’s the home of analogue sound, of warm, dusty machines, where the ambitions of independent artists get turned into classic recordings. It’s also where Metronomy made Love Letters, that classic electronic pop album, which is still sending its message straight to your heart. February 27, 2015 Record Store Day 2015 – Why bother with an official list? Next Post Demons, compost, prize winners, yearbooks, Y.A.